William Frederick Halsey, Jr., was born in Elizabeth, New Jersey on 30 October 1882, the son of Master William F. Halsey, USN. He graduated from the U.S. Naval Academy in 1904 and spent his early service years in battleships and torpedo craft. The latter became a speciality -- he commanded the First Group of the Atlantic Fleet's Torpedo Flotilla in 1912-13 and several torpedo boats and destroyers during the 'teens and 'twenties. Lieutenant Commander Halsey's First World War service, including command of USS Shaw (Destroyer # 68) in 1918, was sufficiently distinctive to earn a Navy Cross. In 1922-25, Halsey served as Naval Attache in Berlin, Germany and commanded USS Dale (DD-290) during a European cruise. 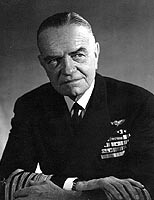 During 1930-32, Captain Halsey led two destroyer squadrons. 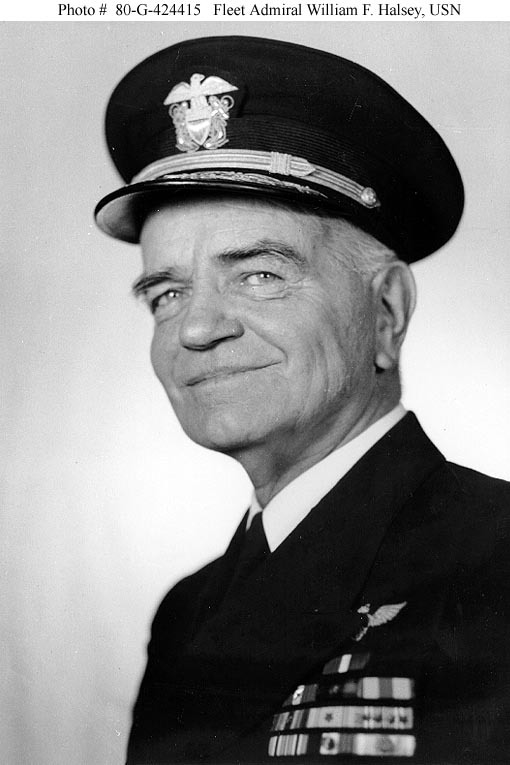 He studied at the Naval War College in the mid-1930s and also received instruction as a Naval Aviation Observer. 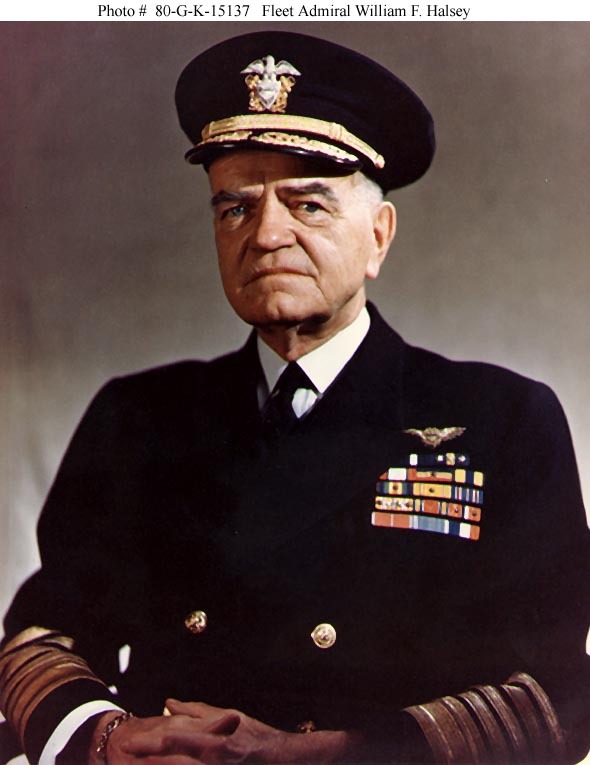 He then commanded the aircraft carrier Saratoga and the Naval Air Station at Pensacola, Florida. 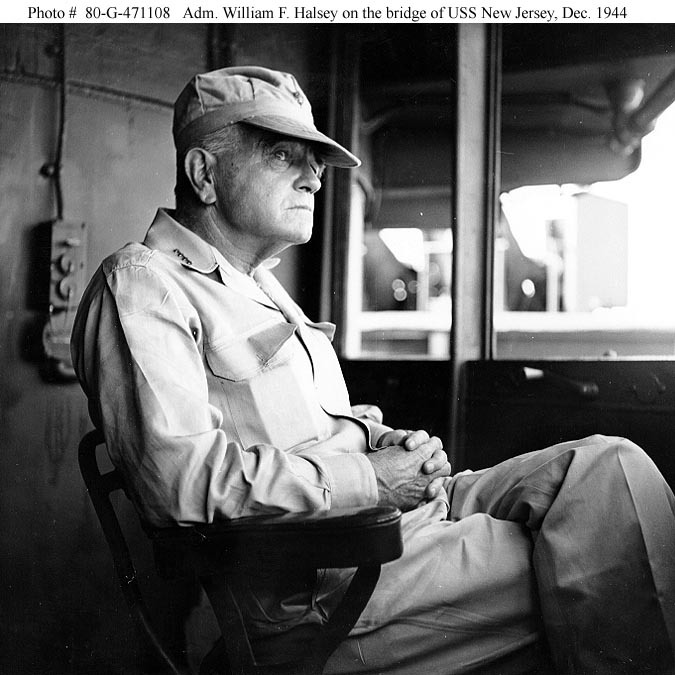 Halsey was promoted to Rear Admiral in 1938, commanding Carrier Divisions for the next three years, and, as a Vice Admiral, also serving as Commander Aircraft Battle Force. Vice Admiral Halsey was at sea in his flagship, USS Enterprise, when Japan attacked the U.S. Pacific Fleet at Pearl Harbor on 7 December 1941. 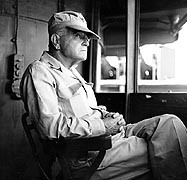 During the first six months of the war, his carrier task force took part in raids on enemy-held islands and in the Doolittle raid on Japan. 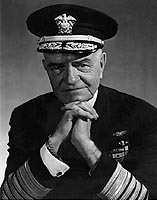 Beached by illness just before the June 1942 Battle of Midway, he took command in the South Pacific in mid-October 1942, at a critical stage of the Guadalcanal Campaign. 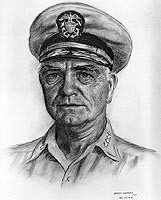 After Guadalcanal was secured in February 1943, Admiral Halsey's forces spent the rest of the year battling up the Solomons Chain to Bougainville, then isolated the Japanese fortress at Rabaul by capturing positions in the Bismarcks and Admiralties. 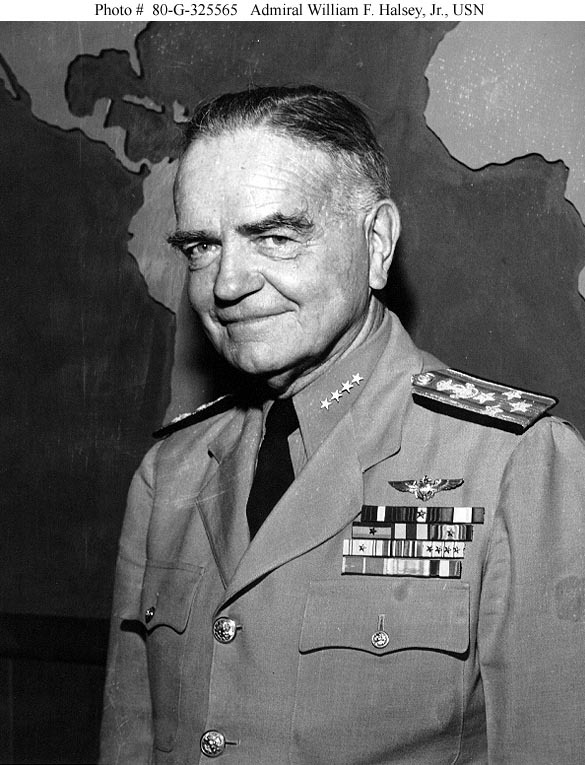 Admiral Halsey left the South Pacific in May 1944, as the war surged toward the Philippines and Japan. 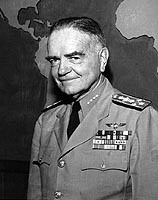 During September 1944 - January 1945, he led the Third Fleet during campaigns to take the Palaus, Leyte and Luzon, on many raids on Japanese bases, and during the Battle of Leyte Gulf. 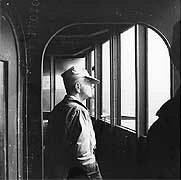 He returned to the combat zone in late May 1945 to command the Third Fleet through the end of the Pacific War and was present when Japan formally surrendered on the deck of his flagship, USS Missouri, on 2 September 1945. 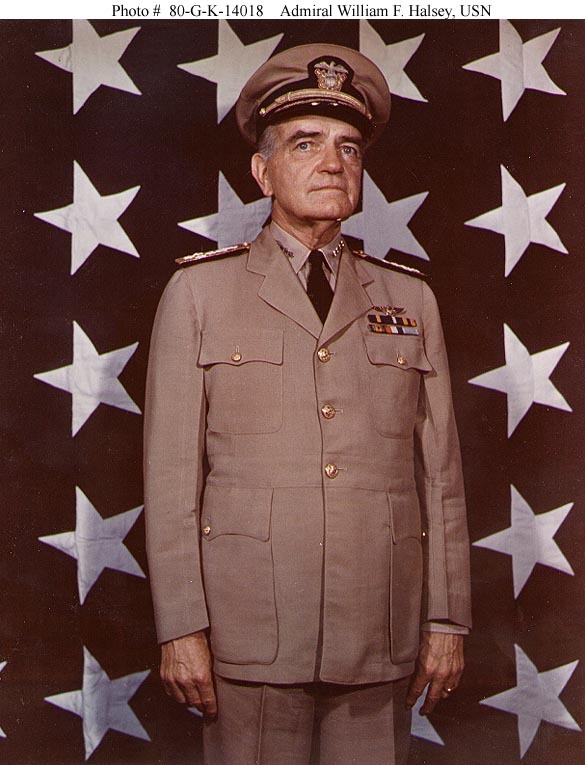 Promoted to the rank of Fleet Admiral in December 1945, Halsey retired from active duty in March 1947. 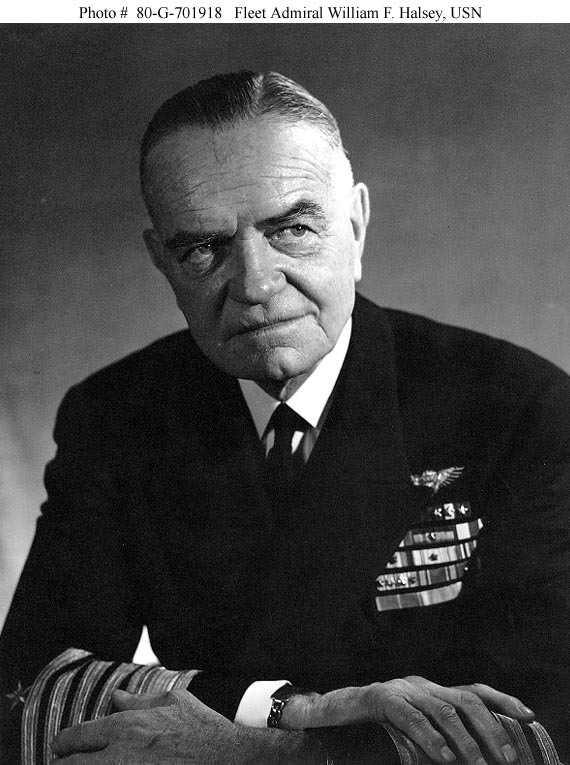 Fleet Admiral William F. Halsey died on 20 August 1959. The guided missile frigate (later guided missile cruiser) USS Halsey (DLG-23, later CG-23), 1963-1994, was named in honor of Fleet Admiral Halsey. 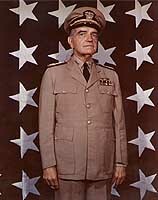 This page features selected individual views of Fleet Admiral William F. Halsey and provides links to other pictures of him. 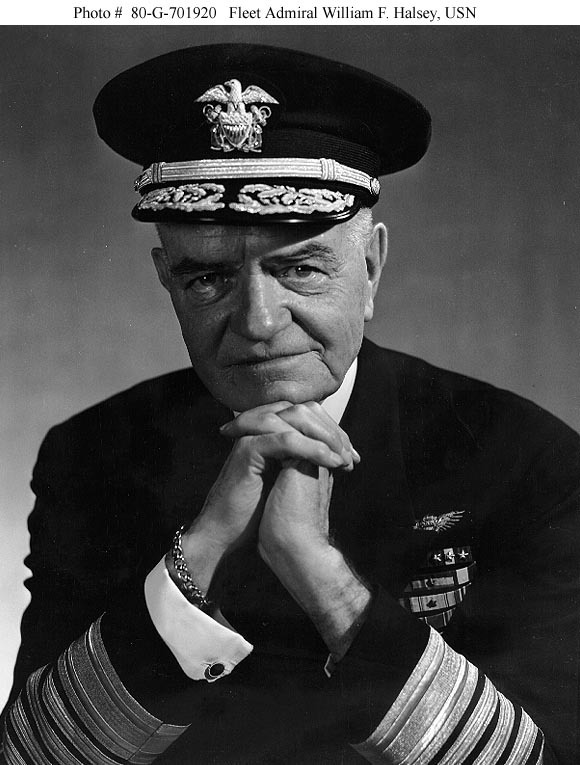 Photographed circa 1941, while he was serving as Commander, Aircraft, Battle Force. Copied from the USS Enterprise (CV-6) "War Album", Volume 1. 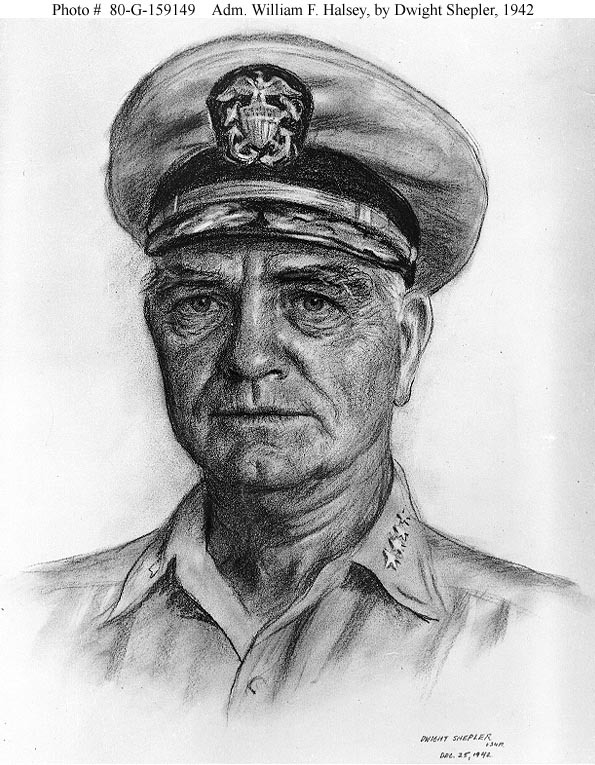 Sketch portrait by Dwight Shepler, USNR, 25 December 1942. 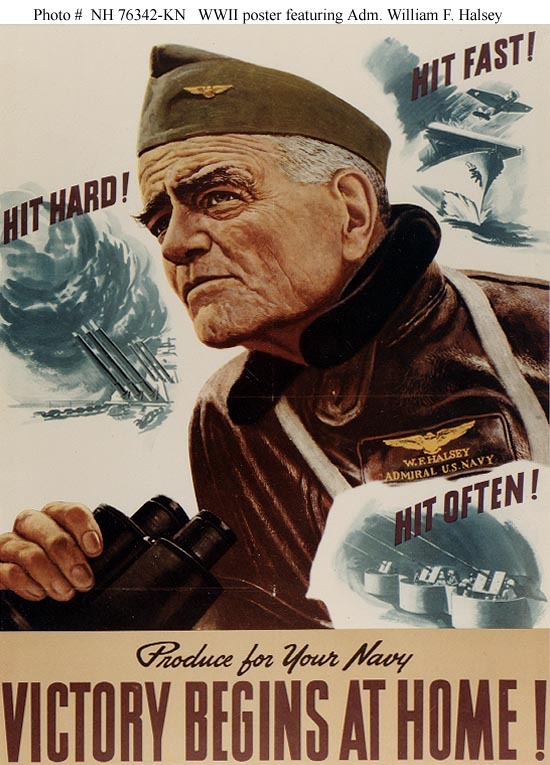 Production incentive poster produced for the Incentive Division, Navy Department, by the Einson-Freeman Company, Inc., New York, during World War II. 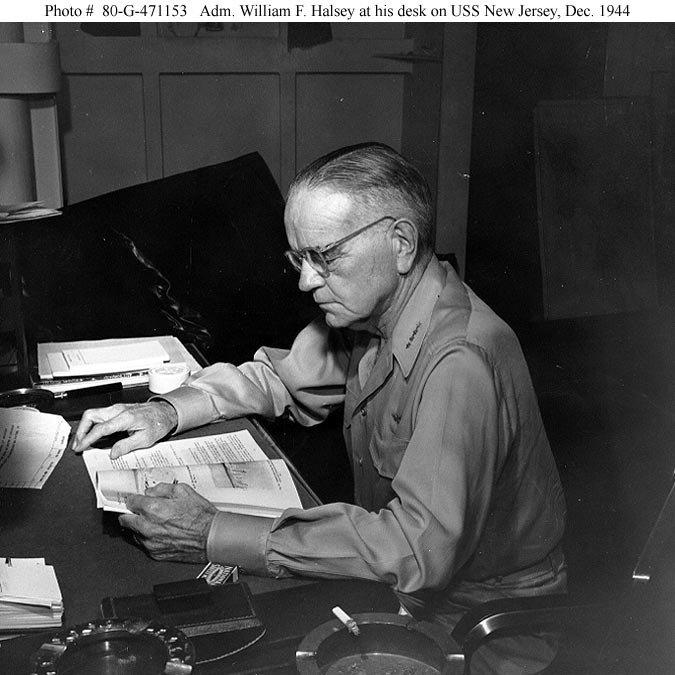 It features Admiral William F. Halsey, USN, and encouragement to "Produce for Your Navy". Courtesy of the U.S. Navy Art Collection, Washington, D.C. Donation of the Steamship Historical Society of America, 1965. Standing in front of the U.S. flag, circa 1944-45. Photograph dated 10 July 1945. 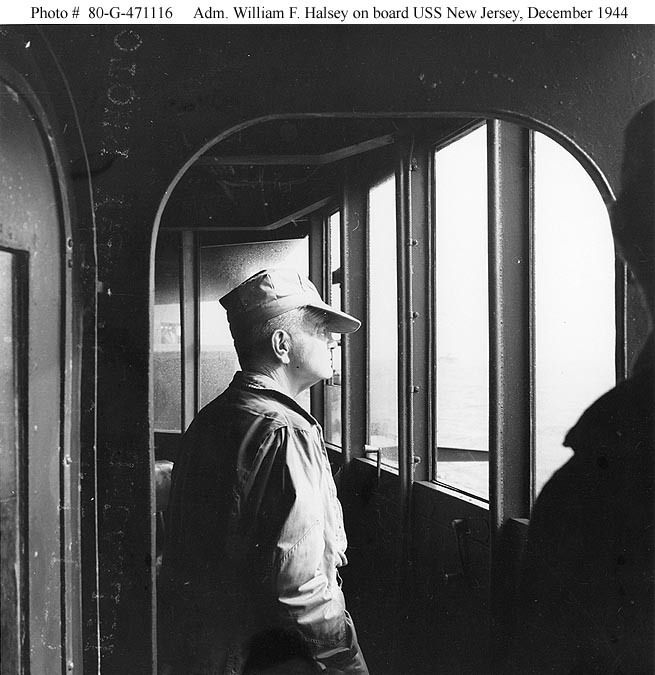 It was probably taken at the Navy Department, Washington, D.C.
On the bridge of his flagship, USS New Jersey (BB-62), while en route to carry out raids on the Philippines, December 1944. 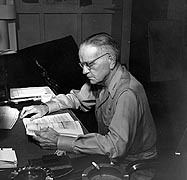 Reading at his desk on board USS New Jersey (BB-62), his flagship, while en route to conduct raids on the Philippines, December 1944. 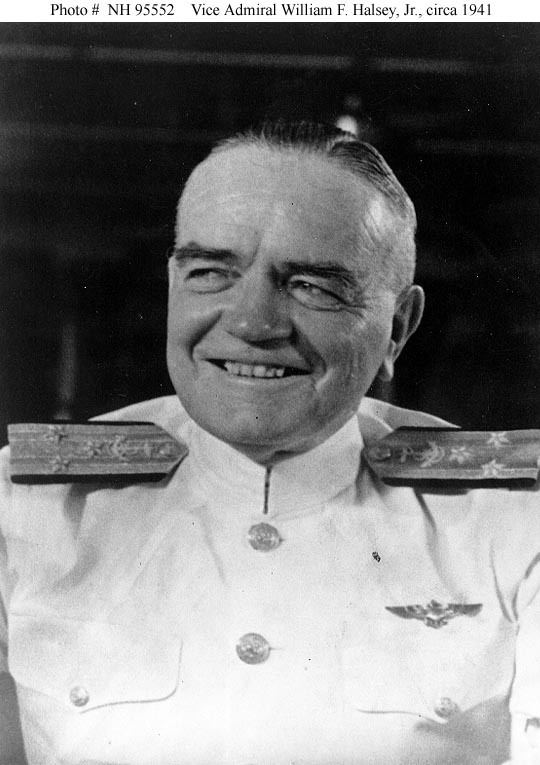 Portrait photograph, probably taken in late 1945, soon after his promotion to Fleet Admiral. Portrait photograph, dated 6 February 1946. Photographed circa late 1945 or early 1946.